Are you into fidget spinners? I’m not, but if I were, I’d probably make good use of the ZenPod. A fidget spinner is a toy that consists of a ball bearing in the center of a flat structure made from metal or plastic designed to spin along its axis with little effort. Fidget spinners became popular a couple of years ago. They've been promoted as helping folks who have trouble focusing or those who fidget to relieve nervous energy, anxiety, or psychological stress. There are claims that a fidget spinner can help calm down people who have anxiety and other neurological disorders like ADHD and autism. As a former special ed teacher, I’m dubious, but can’t personally vouch for or against the theory. However, as a toy, lots of folks find fidget spinners to be a lot of fun. So what’s the ZenPod. It’s a $29.99 spinner case for Apple’s AirPods. It has two integrated high-precision bearings that handle the spinning duties well. 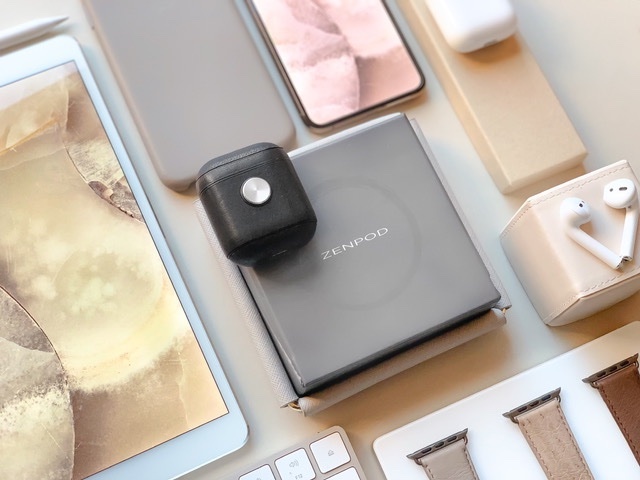 The ZenPod also looks and feels classy thanks to its Nappa leather exterior and impact-resistant polycarbonate frame (which makes it a nice protective device for the earbuds, fidget spinning or not). The ZenPod easily fits into a pocket thanks to its slim design and chamfered edges. It’s available in the following designs: black/black spinner, black/silver spinner, and brown/silver spinner. If you’re not sure the ZenPod is for you, you can go to the product page and view some videos of it in action.